Humans are creatures of habit, and we often live by the same rules our entire lives. Unfortunately, some of the most widespread ‘rules’ about skincare, beauty and makeup are nothing but old wives tales. 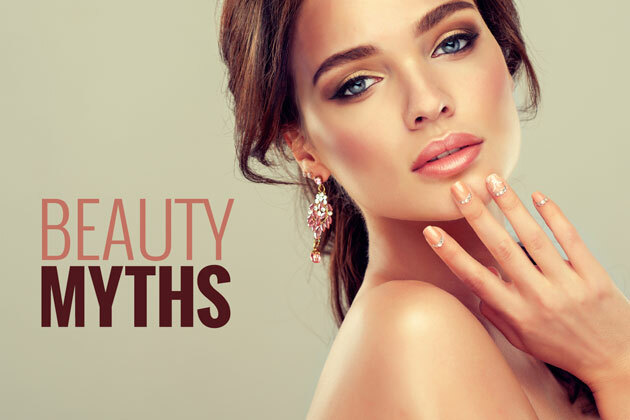 We decided to take a look at some of the most common myths about skincare, beauty and makeup and see if they were fact or fiction. 1. Everyone needs an eye cream. False! The beauty industry has products across a range of prices and there is absolutely nothing that separates many of them but the name of the brand they are attached to. Skim over brand names and search for the products active ingredients, as this is where you will see the true difference in quality. False! But don’t pick up the Hersheys yet. Whilst there has been no link between chocolate and pimples, scientists believe that rapid fluctuations in a person’s blood sugar levels can affect the function of their sebaceous glands. This in turn has the potential to aggravate acne. False! The razor has had a bad rap for years now because of the totally false claim that your hair will grow back thicker. Many women report the sensation of thicker hair growing back between shaving their legs because the prickle you can feel is the thicker part of the hair shaft growing in. This is because shaving cuts the hair off mid shaft. False! Unfortunately there is no product out there that can eliminate stretch marks. Cocoa butter is moisturising and great for your outer layer of skin, but stretch marks are caused by broken elastin and collagen fibres. These reside deep within the skins tissue, where moisturiser cannot reach. False! Your hair does not magically speed up in the warmer months. Scientists say that it may just appear longer because the sun naturally bleaches our strands and blonder hair reflects the light. False! Overstimulating your skin with harsh anti-ageing ingredients like Retinol can work against you and thin your skin unnecessarily. However, it is never too early to start using SPF as this is the best way to avoid again all together.